A spirit book — titled “Renewed Wisdom” — by Newburyport artist Susan Kapuscinski Gaylord. The twisted brambles and time-warped twigs, made into otherworldly tomes perched in nests, look as if Hogwarts textbooks left the wizarding world and flew to the Arnold Arboretum. Susan Kapuscinski Gaylord, of Newburyport, handcrafts these pieces — what she calls “spirit books” — from items she finds on her nature walks. 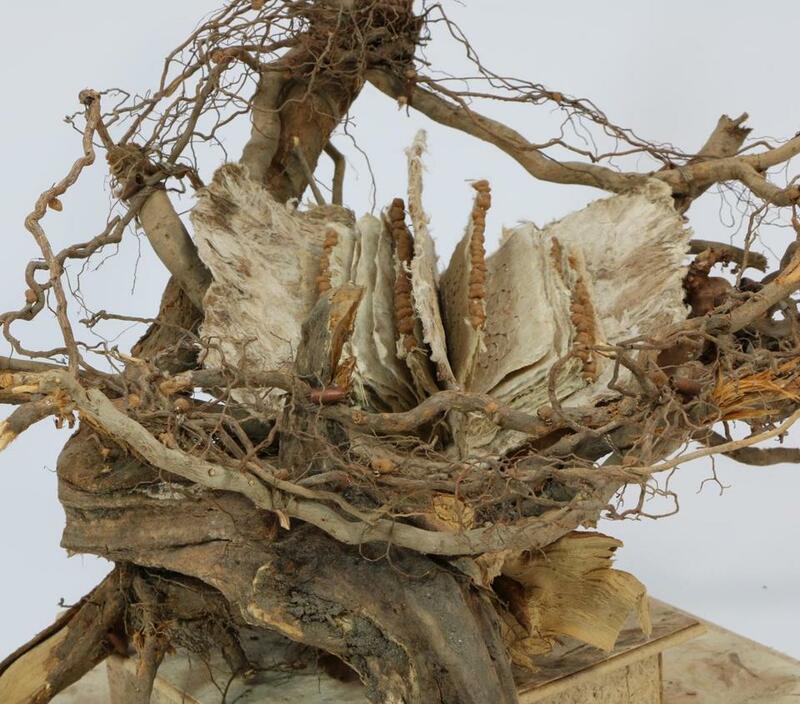 She uses materials such as branches and spiky pods to make cradles for her ancient-looking texts. On handmade paper from places such as Mexico and the Ukraine, she hand-stitches patterns on the pages with copper thread and beads. Fourteen of Gaylord’s spirit books are now on display at the Hunnewell Building Visitor’s Center at the Arnold Arboretum. On Saturday, she will be on the property for a free public opening reception from 1 to 3 p.m. On June 2, she will return to give a talk on her process and literary inspirations from 3 to 4 p.m. The first of her spirit books was made in 1992, as a result of a long-overdue landscaping project at her home. After pruning, she took the best of the clippings into her porch-turned-studio and began her magical, albeit time-consuming, project. After a tour of the arboretum last year, Gaylord sent images of her work to the staff as a thank you. From that, Gaylord wound up finding herself an exhibition space. The timing of this show is meaningful; her mother-in-law was a volunteer at the arboretum, and this exhibition takes place a year after her passing. “My mother-in-law lived in Jamaica Plain for about 40 years and she died last year, so this is a really nice connection,” Gaylord said. The exhibit runs through July 22.